It was around this time of year two years ago that I received a request through my wife from my niece Caron. Would I consider running with her on her Saturday long runs as she trained for the Seawheeze Half Marathon in Vancouver that August? Although she had been running for some time, and had completed several five and ten kilometer races over a few years, the half marathon would be a whole new challenge for her. My answer to this request without hesitation was a resounding YES. I am definitely not much a trainer, but I do love to encourage others achieve their goals. The biggest bonus for me was to get to know my niece better. Life is busy, and running being something we both love, this was a great way to connect. 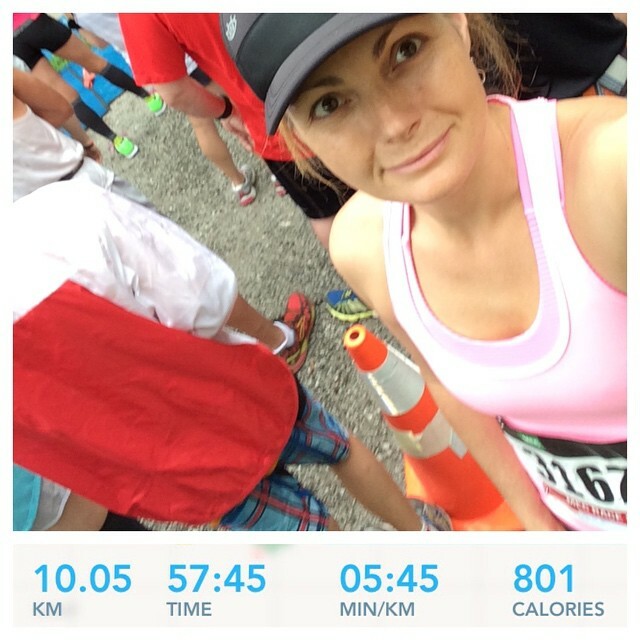 Such a HUGE accomplishment for Caron after running her 1st half marathon in Vancouver in 2014. 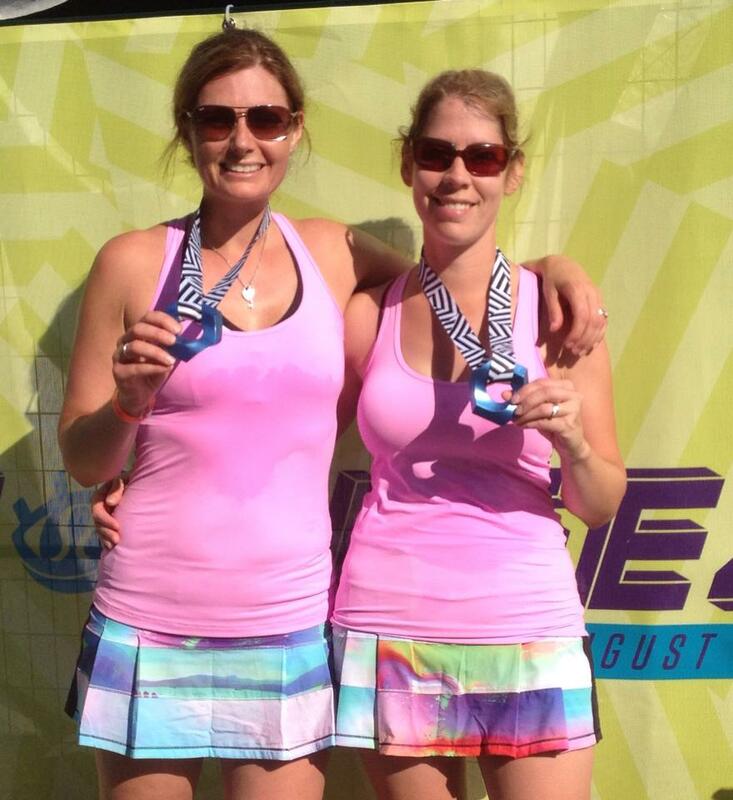 After Caron’s 2014 half marathon our training runs together simply ended. I still continued my training for the Toronto Waterfront Marathon which was held in the middle of October. The year 2014 rolled into 2015. A new year and more training for both of us. Starting in March 2015 I was running at least a race a month, and Caron was training for another Seawheaze Half Marathon. But in 2015 she was unstoppable, oozing with confidence, nothing could hold her back. She was part of a Facebook runners group page where members encourage and challenge one another. 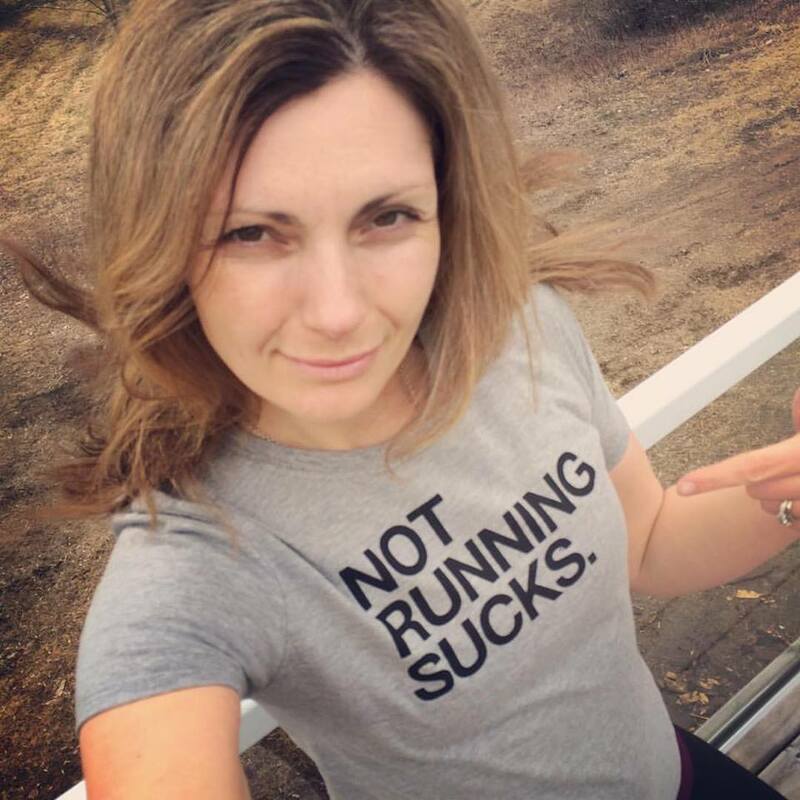 And through that Facebook group her #runstreak was born: running at least a mile each and every day, no matter the weather conditions, no matter how you are feeling. The discipline this takes is tremendous. I can think of the numerous times I decided not to run on certain days because I was not up to it. In Canada the weather can reach opposite extremes. Summer days can reach well into the 30’s Celsius with high humidity. Winter days can get as low as the -30’s Celcius plus wind chill. Taken July 20th, 2015 on an extremely hot day. Day 100 of Caron’s Runstreak. Caron has an Instagram account @this.girl.runs that has built up a very large following. In it she records every day of her #runstreak, often including her thoughts during her runs which offer words of inspiration and encouragement. Her runs are a minimum of 1 mile, but most are MUCH, MUCH longer distances. After her original runstreak goal of 100 days, it just felt normal to continue. It had become routine. One hundred days in a row became two hundred days in a row, which became three hundred days in a row. Runstreak day #225. The other season extreme is winter. Caron is wearing “yaktrax” for better traction. Sometimes we raced the same event, but different distances. 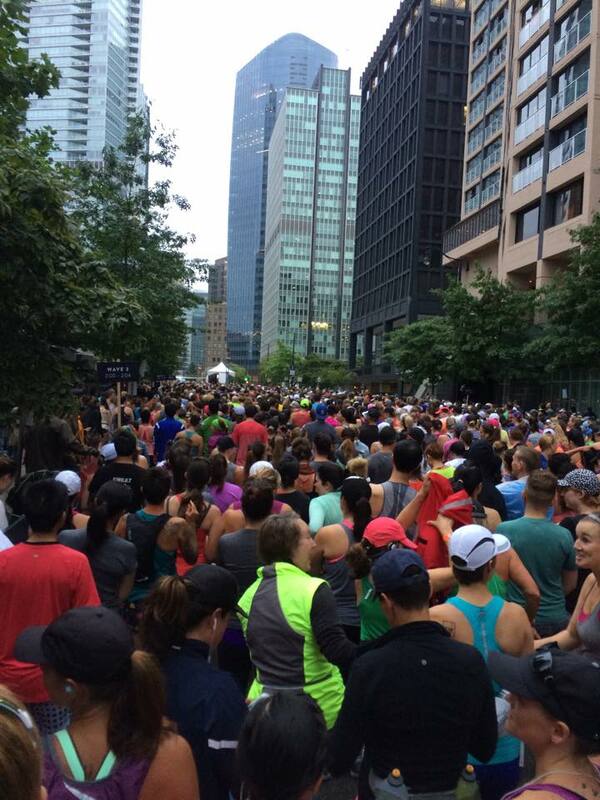 This race was on June 27th, 2015, day #77 of Caron’s Runstreak. Caron had run a long training run of 37k’s the previous day. That same previous day I ran a much shorter 10k race event. A short 5k was the perfect fit for both of us. So much had happened in our individual running accomplishments over those 20 months since we last ran together. But then again as we ran it seemed like nothing happened, just like old times as we ran together. 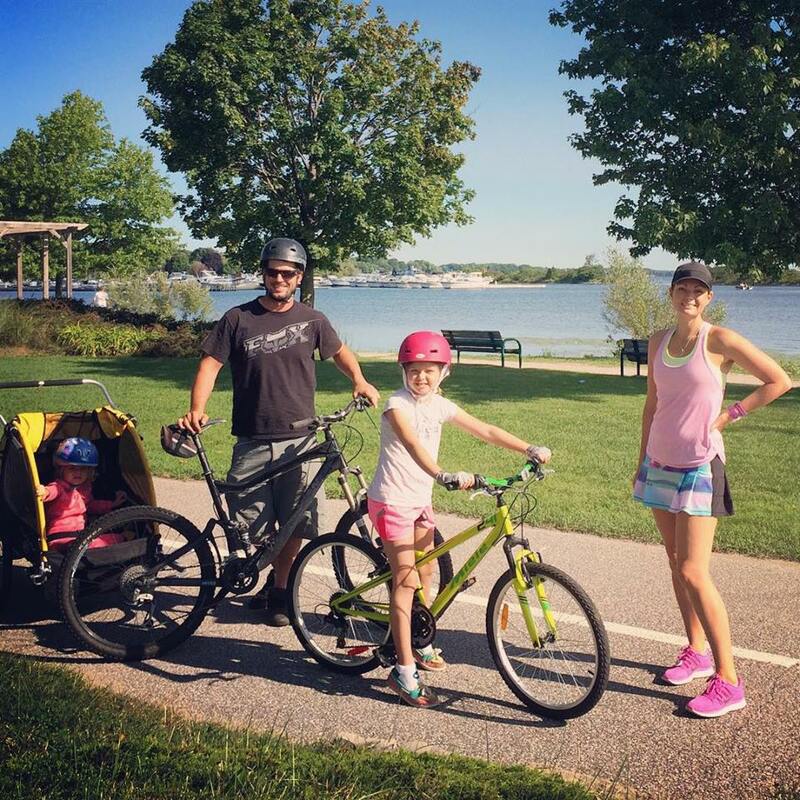 Caron had nothing but praise for her husband who looks after their 2 precious girls while she goes on her runs. And the family is at the events cheering her and supporting her on as she races. Day 134 of Caron’s Runstreak. Such as on this 7k run, sometimes the family will ride along while Caron runs. After running 365 days in a row covering several thousand kilometers, Caron mentioned that no matter how well you eat, care for yourself and train there will be bad runs. It might be a run that just does not go well. It might be a race event that you are well prepared for but goes wrong. It happens. But tomorrow is a brand new day. During our short run there was times when we chatted and times when we ran together silently. Breaking one of those silent periods Caron looked over and quietly said, “I think tomorrow is going to be a rest day”. My mind was scrambling, “Is this the end of the runstreak”? 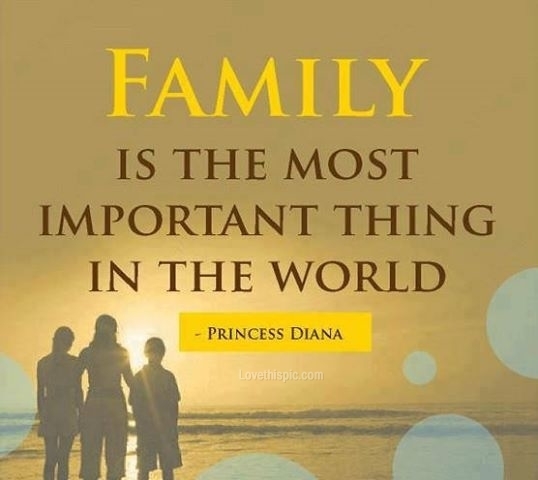 Breaking my thoughts she continued, “My family is so important, they are my priority”. She did not want to go back to her old ways of not running but also wanted a new chapter and new challenges that did not involve that daily sacrifice from her family. A cool thing is I have done some training runs where Pick Your Poison is to be held. (just a few miles from home). Photo taken last summer as I was preparing for another trail race. 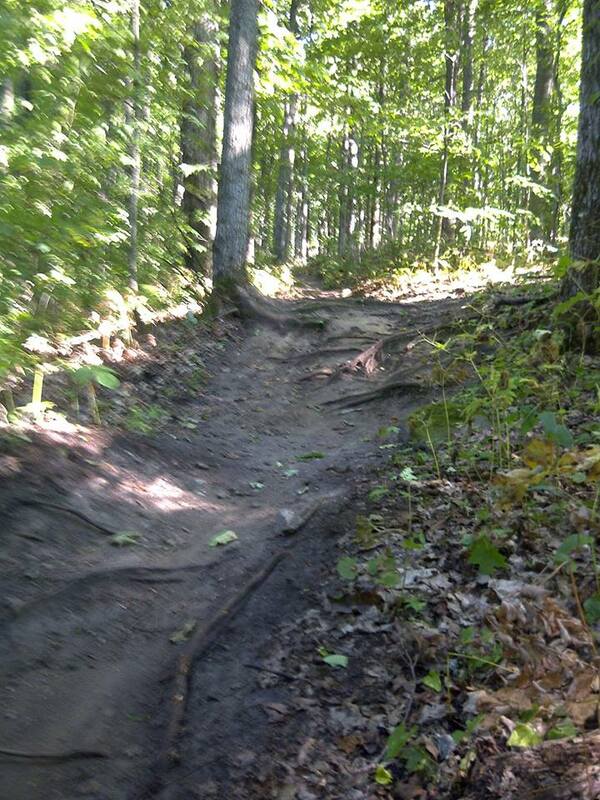 Being early spring for Pick Your Poison, trail conditions could be much wetter. As mentioned previously, Caron is on Instagram under the name this.girl.runs. This was her post on her 1st rest day in a year. “Be brave enough to say good bye and life will reward you with a new hello. Instagram photo accompanying Caron’s quote above. The day after Caron’s 1 year runstreak and looking forward to her new road ahead as an #ultrarunner. I loved hearing how you bonded with your niece over running and how Caron transitioned out of the daily run to ultra marathons. Good metaphor there for moving forward in life and remembering what’s important. Seriously though, running in -10c weather? That’s crazy! Thank you so much for stopping by and sharing Tricia. Am so much in awe of Caron’s self confidence in herself to make the transition. She has such a large following on her Instagram following her runstreak, but she knew what was important and is not looking back. I know the -10C in California must sound extremely cold, but it is not too bad (actually is +14F). It is amazing how warm you become after running even as little as a kilometer. But knowing what to wear during winter runs is pretty crucial. Caron sounds like an inspiration who listens to the inner voice. Knowing your priorities and understanding your body’s demands is important and she has maintained that balance. You seem to have shared some great time together… And inspired each other. Good luck for your run 🙂 To both of you! Thanks so much for sharing such a wonderful comment Prajakta. Caron does have such a remarkable grasp of her priorities and keeping them in check and balance. She is an inspiration. I love it when we get together, but even the times when we don’t get together, through technology we still encourage and inspire each other. You are amazing! How wonderful to support your niece and getting ready for an ultra. Wow! Go, Caron, Go! That’s awesome!!! And I know she’ll rock the Pick Your Poison!!! Thank you so much Fleck. ALWAYS love that spirit of yours. Yeah Caron is going to be absolutely AMAZING at Pick Your Poison!! So many runners like myself are just getting back into more consistent training., but Caron is totally ready to tear up those trails! Such a wonderful post! Love how you and your neice have bonded over your love of running. Both of you are a real inspiration! Will be checking out her instagram for sure! Thank you very much Tasha for dropping by and for sharing your very kind words. When I look back over these past 2 years, it has been pretty cool. Your niece is amazing! Congrats to her! Also, you are an awesome Uncle! Love your support! Congratulations to Caron – both for the dedication & commitment to her runstreak, and for the bravery to end it. How exciting to move on to the challenge of ultrarunning! She has a fantastic perspective, through her own eyes & through yours. Lovely! WOW…Kim, this is incredible how you summed up Caron’s running adventure. I LOVED it. I can see why you are so proud of your niece, Carl…she seems like a beautiful person, inside and out! And such motivation…wow! I loved reading your story of how the two of you bonded. I have five nieces that mean the world to me, and so I know just how important and precious a relationship like that is. Always appreciate your kind, supportive words Denise. Caron is an amazing person, and a very precious niece. She has probably been running a lot longer than me, and it is incredible through her 1st half marathon training, we started to run together, bond and support one another in our running. Thank you for sharing about your own nieces. Very beautiful! Thank you for taking the time to read Lilka, and for sharing your thoughts to sum up the post in such a powerful, beautiful way. The family support was HUGE for Caron. She has so much praise for her husband. And it is really cool that her oldest daughter runs along on her shorter runs. Very precious. Your words “tenacity to continue plus the courage to change” sums up Caron so well. She is so amazing, and I am so very proud of her! I had to pipe in at this point, because Lilka said exactly what I was trying to put into words…..very inspiring post!! There definitely would be winter weather extremes from Denver and San Diego. 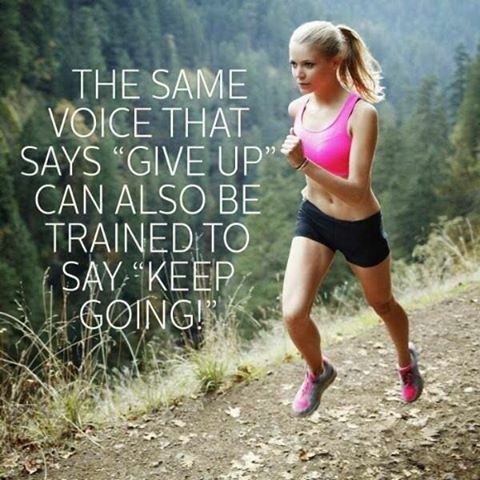 I remember you mentioning way back that knee issues are restricting your running, which has got to be hard. Hopefully San Diego has lots of opportunity for hiking. How awesome is this? I love the idea of a #runstreak – and I am so glad you got to play a part in getting her motivated to run. You may be proud of her, but I am sure she is proud of you. Caron has become such a strong runner and I am indeed so proud of her. She is ALWAYS so positive. Yeah, she is also proud of me, and it has been so cool having this camaraderie together. I have been mulling this over all week, since I read your post. I think I’m going to start it on Sunday with the new month (I’ll probably post the day after each walk, just to be on the safe side for those days when I am on the road). It’s such a great idea, and like I said, it’s been on my mind all week – so inspiring! Yeeeeaaaahhhhh!!!! This is so awesome. And Choppy is going to love it too. Thank you for sharing your follow up Sarah! Thank YOU for the post! I have the post for Sunday’s announcement of the challenge all drafted. I suppose I still have a few days to renege, but it’s pretty much a reality at this point! I run three times a week, but not to prepare for a marathon. I even dread to run more than 3 miles. Kudos and good luck to you and your niece for all your running activities. That running on snow looks intense! 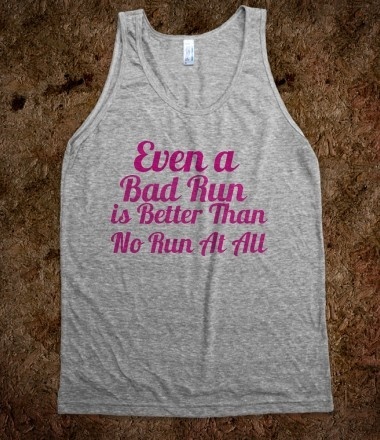 That is awesome regarding your running. Running clears out the head for me, and often just 2 or 3 miles does the trick. Yeah running in snow really is intense. 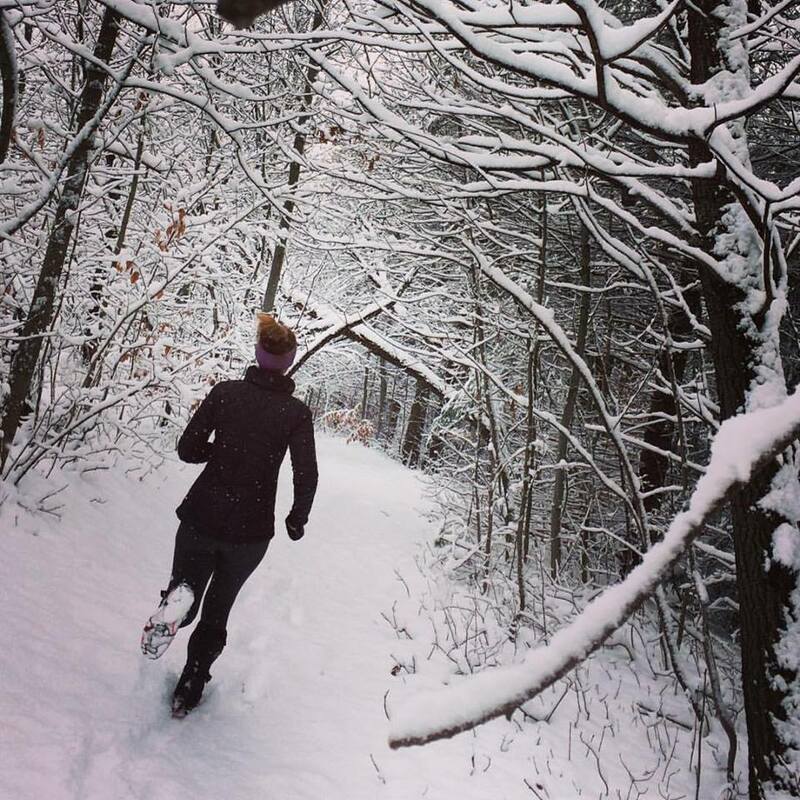 The deeper the snow, the tougher it is to run through it. Even though it is winter temperatures, it does not take long for the body to really get warm. This is tremendous. Walking is SO underrated. I don’t run nearly the distances that marathon training plans recommend as I do have knee issues, but I do a pile of walking and it works wonders on those day I decide not to run! I’m impressed. And relieved to know that even for at expert runner there will always be bad days. It was an encouragement to hear these words from Caron that I am not alone when there is a bad day. This is a testament to willpower, persistence and self growth and its impact on our overall lives. The power that one positive activity can create and its ability to drive us to greater accomplishments in life is simply remarkable. You have found a component in health missing from so many lives. Looking forward to reading more inspiring stories. Thank you so much. It is obvious, you are a good man with a good heart. Have a wonderful weekend!